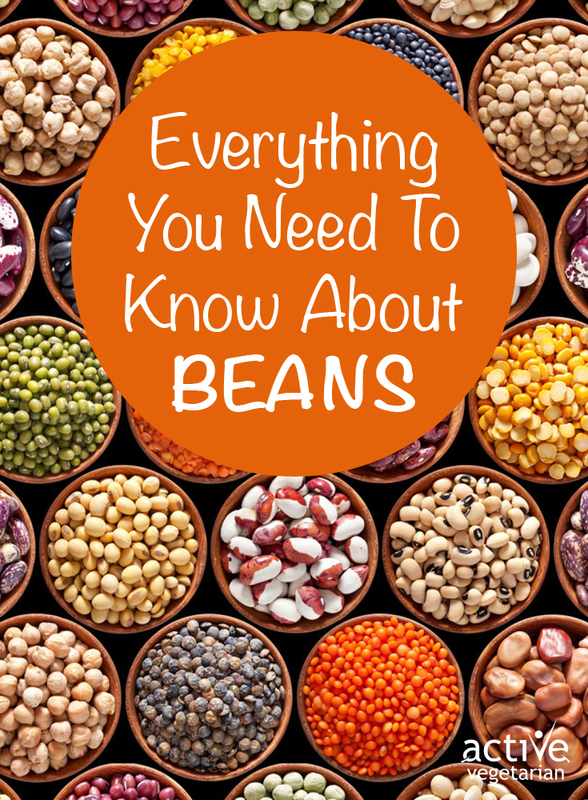 If you have been on your plant based journey for some time, you have come to understand that beans and legumes play an important role in this diet. And for many good reasons. Even with this knowledge it’s amazing how many people try to avoid eating this “superfood”. Approximately 25 percent of people in North America and other Western countries experience dyspepsia, a recurrent or persistent pain or discomfort that is primarily located in the upper abdomen. This could be caused by lactose intolerance or an inability to digest beans. Many people find that after about three weeks of eating beans every day, this problem goes away. If you’re new to beans, start with smaller ones, such as lentils and dal. Then work your way up to mid-sized and larger beans, such as garbanzos. and kidney beans. Soaking dried beans, adding kombu, hing or asafoetida to the cooking water, and cooking the beans until they are very soft and tender are three steps you can take to reduce any potential discomfort from eating beans. If you’re unfamiliar with cooking beans from scratch, it’s easier than you might think, and it will have a dramatic and positive effect on your health as well as food budget. Another secret to plant based eating and staying on a budget is simply getting your main protein from beans or a bean product, adding whole grains, keeping the main portion of your meal centered on vegetables, and having fruit for dessert. And of course eating lots of salad. When you eat this way you’ll feel so good, financially and physically. As mentioned before, soaking dried beans before cooking can enhance their tenderness and flavor. Soaking may also help minimize the gas that some people experience when they first start eating beans.To start, try eating small amounts of black beans, black-eyed peas,lentils and dal. After you are accustomed to eating smaller beans, try larger beans, such as garbanzo and pinto beans. Adding kombu (a type of sea vegetable) or hing/asafoetida (Indian spice) at the beginning of the cooking process may help minimize gas while adding flavor and nutrients. You can also just try cooking the beans ten to fifteen minutes longer than normal. Lentils and split peas are so small that they don’t need to be soaked. Other beans need to be soaked for eight to twelve hours. This can be done overnight, while you are sleeping, or while you are at work. Simply soak the beans in the appropriate amount of water (see the ratios listed in the chart), making sure that the beans are covered by at least one inch of water. After the beans have soaked, drain the water and replace it with fresh water. Examine the dried beans and throw away any foreign particles or beans that are discolored or shriveled. Rinse the beans with water and drain. Soak the beans for eight to twelve hours (at room temperature or in the refrigerator) before cooking. Some small beans do not require soaking. Put the beans in a large pot and cover with fresh water. Bring to a boil over medium-high heat, then decrease the heat to low and keep the pot covered while the beans are cooking. Add more water, if necessary, during cooking so the beans remain covered with water. Add seasonings to the beans while they cook. Many people believe that the taste of beans improves with salt, but others believe that adding salt can extend the cooking time and possibly toughen the beans. When the beans are tender but firm, they’re ready to eat or add to your favorite recipes. Alternatively, if you prefer a shortcut over a long soak, put the beans and water in a large saucepan and bring to a boil over medium-high heat. Boil the beans for one minute, remove the pan from the heat, and let the beans soak for one hour. Drain the beans, return them to the pan, and cover them with fresh water. Cover the pan, bring the beans to a gentle boil over medium-high heat, then decrease the heat to low and simmer the beans. Depending on the size of the beans, they should be tender after one and one-half to two hours. Taste one or two beans to be sure. If they aren’t quite done, continue cooking until tender. For the best results, test the beans frequently. Add hot water, if necessary, to keep the beans covered with liquid. Cooking beans in a pressure cooker cuts the cooking time down to literally just a few minutes, so you may want to consider investing in one; the cost will eventually be offset by a reduction in your utility bill 😉 As an added benefit, pressure-cooked beans are easier and more convenient to prepare, so you may be more likely to eat them. Some beans require soaking before pressure cooking, but if you don’t have time to do that (or if you forget), you can simply cook the beans under pressure several minutes longer. A few bean varieties, such as split peas, should not be cooked in a pressure cooker because they fall apart too easily or foam excessively, which can clog the pressure-release valve. Never fill a pressure cooker more than halfway with beans and water. 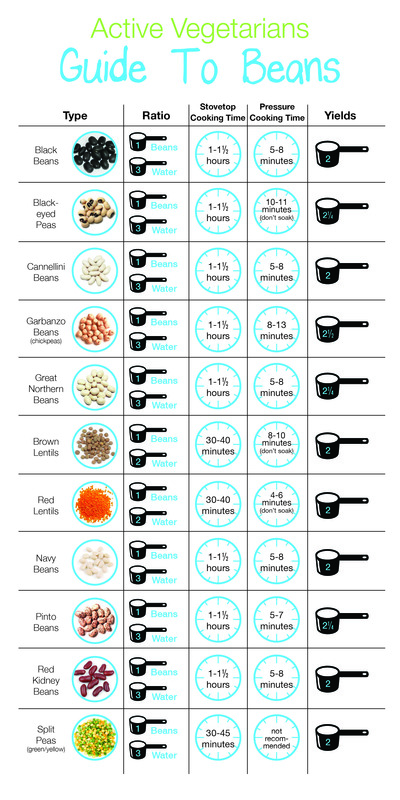 The above table is a guide to help you cook beans, either in a saucepan or a pressure cooker. The times are for soaked beans (except where indicated). For pressure cooked beans, the cooking time is for beans cooked under high pressure (fifteen pounds) and includes allowing the pressure to come down naturally. If you use a quick release method instead, you will need to cook the beans a few minutes longer. A convenient and easy method for cooking dried beans is to use a slow cooker. Simply soak the beans in water for eight to twelve hours overnight. In the morning, drain the beans, put them in the slow cooker, cover them withfresh water, and set the slow cooker on low. Then go off to work and let the beans cook all day. Larger beans in particular can cook on low heat for eight hours or even longer if you are working late. Slow cookers, even programmable models with timers, are inexpensive, widely available, and can easily last twenty years or longer. If you don’t already own a slow cooker, consider buying one. It would definitely be a good investment. There is some pretty toxic stuff circulating in our food supply! This estrogen-like man made chemical is pervasive in canned foods. BPA is linked to a wide array of health concerns like Reproductive problems, cancer risk, metabolic disorders like obesity, Type 2 diabetes and insulin resistance, heart disease and neuro-behavioral effects like ADHD. BPA is particularly risky in canned tomatoes because the acidity of the tomato can leech even more of this toxin in to the food.On top of that most tinned beans have a lot of salt and sugar added, which I consider completely unnecessary. Make sure the ones you buy have no salt and sugar added. The organic ones are often very good. But overall, do your best to avoid canned foods altogether.